Ingredients: Jesse Eisenberg, Aziz Ansari, Danny McBride, Nick Swardson, Fred Ward, Michael Peña, Dilshad Vadsaria and Bianca Kajlich. Directed by Ruben Fleischer. Run time: 83 minutes. Rated: R.
At First Bite: I worked as a pizza delivery guy for three and a half years. I remember the story of Brian Douglas Wells, the delivery guy with a bomb strapped to his chest who robbed a bank. Basically, if you remember the story behind that botched 2003 robbery, then you know the plot of 30 MINUTES OR LESS. Dwayne (McBride) can't wait for his dad to die. He figures the inheritance would be rather large. A stripper suggests he hire a hitman. 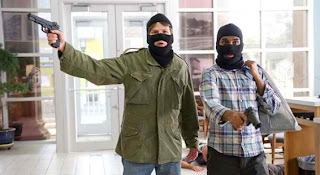 In order to pay for the hit, Dwayne and his buddy Travis (Swardson) kidnap an unsuspecting pizza boy named Nick (Eisenberg) and force him to rob a bank wearing a bomb. Tough to Swallow: The Major interrupts Dwayne and Travis while they're watching FRIDAY THE 13TH (3D). Dwayne says there's 45 minutes left, but it's the final scene of the movie. The outtakes on the DVD aren't funny. Something to Chew On: Ben Stiller was one of the film's producers. This is Fleischer's second feature film. He previously directed ZOMBIELAND, also starring Eisenberg. In the beginning of the movie, Nick rents the first two LETHAL WEAPON films. Later, Dwayne is talking to Travis about his tanning salon idea. He calls one of the tanning options the Tanny Glover. Following the credits, there's a commercial for Dwayne's tanning salon. Aftertaste: There are a few funny moments. Not a lot, but a few. And, they come from the Eisenberg/Ansari tandem instead of McBride and Swardson, which was a surprise. I love Swardson, but McBride seems to play the same guy in every movie (essentially Kenny Powers). He's like the Tommy Lee Jones of comedy. I can't complain about this movie too much. Even though it's not as funny as I wanted it to be, it's only 83 minutes long. So, I didn't feel like I suffered through it. Especially, since it's peppered with scenes featuring the lovely Dilshad Vadsaria ("Greek"). As a follow-up to ZOMBIELAND though, Fleischer dropped the ball. Maybe he should stick to original ideas. Or at least have more of a script and not rely on ad-libbing. Heavy on the cheese, light on the sauce.